I was wondering what would happen if I tried to crochet a tutu. This is the answer. Because it is made with sc stitches this tutu is very dense, labour intensive and also quite heavy. Its weight gives it a nice swishing motion when you twirl or jump. The way I’ve designed it, it needs to be put on over your head, but there is no chance of it falling down. The tutu is made with 8ply wool and a 4mm hook and the pattern is written in American crochet notation. 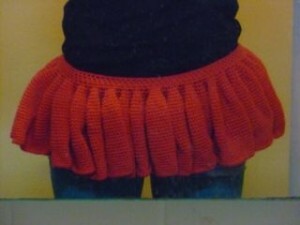 The pattern describes how to make this exact tutu. But down the bottom are some instructions on adapting it for your size. Chain 100, slip stitch into the first chain to form a ring.